I have another great stocking stuffer idea here. Everyone needs a great mascara, right? Well essence makes some of the best mascaras on the market and they don't break the bank on price. Their mascaras are amazing!!!! 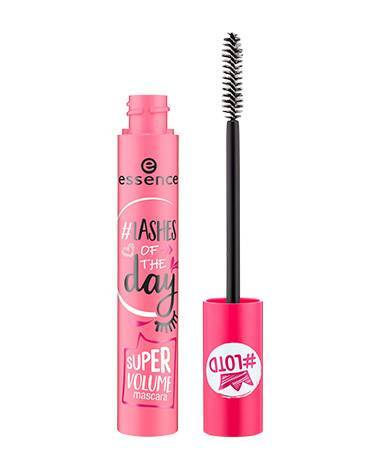 One of their newest mascaras is called #lashes of the day super volume mascara and it gives the perfect amount of volume and curl to your lashes. With the brush that it has it reaches every lash and gives the perfect amount of curl to every lash. As you can see the difference is HUGE! My lashes are invisible and look almost non-existent. But when I put on this mascara my lashes become extremely long and lush, with just the slightest bit of curll to them. This mascara is one of essence's best I think. It goes on easily and comes off with just makeup remover pads or eye makeup remover. I think it gives eyelashes a lot of volume and length with just enough curl to make them look like they are completely different. #lashes of the day super volume mascara retails for $4.99. It is available online at www.essencemakeup.com and www.ulta.com as well as Ulta Beauty stores. Like essence on Facebook: https://www.facebook.com/essence.north.americal; Follow essence on Twitter: @essencemakeup; Follow essence on Pinterest: http://pinterest.com/essencecosmetic/; Follow essence on Instagram: https://www.instagram.com/essence_cosmetics/; Subscribe to essence on YouTube: https://www.youtube.com/user/essencecosmetics and Follow essence on Snapchat: https://www.snapchat.com/add/essence-beauty.